Cleaning tub and shower tiles is never going to be a fun job, but it doesn't have to be a horrible one. 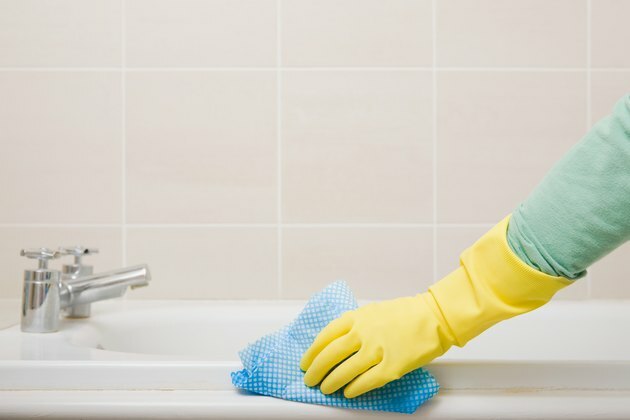 The trick to getting the job done quickly and easily is to do yourself a few small favors in between cleanings, like keeping the tile as dry as possible and using bath products that leave behind very little residue. If you do that and then loosen the dirt before applying your shower cleaner, you'll get the job done fairly painlessly. Remember, though, that mixing bleach and ammonia produces a harmful gas. If you do run into a tough tile cleaning job, always exercise extreme caution if you try more than one cleaner. Bathtubs and shower stalls can stay damp for hours after use, and many are dark. That makes them heaven for mold and mildew, which you may struggle to remove once established. You can help yourself avoid mold and mildew by running a rubber squeegee over your tile walls and floors after you bathe. Then use a towel to wipe them down and mop up any remaining moisture, Leave your shower door or curtain open a bit and let the bathroom fan run for 20 to 30 minutes after your shower. If you prefer not to run the fan, crack a window to improve airflow. Your shower tile will also stay cleaner if you switch from opaque soaps to clear body washes and gels. Gels leave behind much less residue and soap scum. If you find that the goo left behind in your shower is turning an odd color like pink or purple, check your shampoo. The dyes in shampoo and conditioner can lead to some funky grout stains. Avoiding them is easier than removing them. Between cleanings, spray your tile two or three times a week with a diluted commercial shower cleaner or white vinegar at full strength with a few drops of tea tree oil in it. Use one drop of oil for every two ounces of vinegar. Just spray the tile and walk away; there's no need to rinse. Avoid using vinegar if your tile is made of natural travertine or stone. Ideally, you should strive to clean your shower tile once a week. You're not alone, however, if you don't get to it quite that often. When you do find the time, begin by lightly scrubbing the tiles with a plastic scrubbing sponge. This will loosen the dirt and allow your favorite shower cleaner to do a better job. Spray the cleaner on the tile liberally after you scrub the tile and let it sit on the surface for at least five minutes. After letting the cleaner do its work, grab your plastic scrubber and go over the tiles one more time. When you're done, rinse the tiles with hot water. Repeat the process again if needed to get rid of any stubborn mold or grime and then dry the shower with a squeegee and a towel. If you're battling a particularly thick or tenacious layer of soap scum, mix together baking soda and white vinegar to form a paste. You can add a few drops of dish soap or hydrogen peroxide to the mixture as well, if you like. Spread the paste on the tiles and let it sit for 20 minutes to an hour. Scrub the tile with your trusty plastic scrubber and then rinse it thoroughly. As always, don't use vinegar on stone or travertine tile. 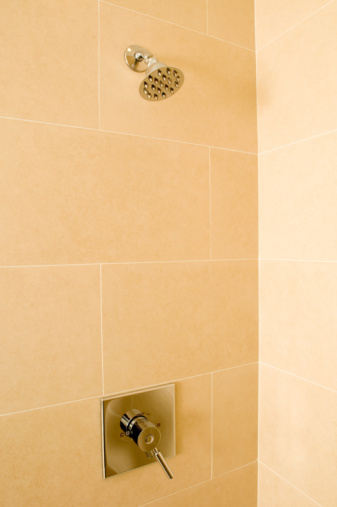 Your grout gets cleaned along with your shower tiles, but it's much more porous and prone to soaking up shower yuck. Once in a while, you'll need to give your grout a little extra care. At a minimum, you should thoroughly clean and then reseal your grout twice a year. To do so, make a paste by mixing two parts vinegar and one part baking soda. If your grout is holding in stone tiles that the vinegar could damage, make your paste from two parts baking soda and one part hydrogen peroxide instead. Apply the paste to your grout using a grout cleaning tool or an old electric toothbrush for extra scrubbing power. Let the paste sit on the grout for a few minutes and then go over the grout lines with the electric toothbrush a second time before rinsing it with hot water. If you plan to seal the grout, let it dry for 24 hours before doing so. Never use bleach or other harsh chemicals to clean grout, as these strip away grout sealer and make grout more susceptible to staining in the future. How Often Should I Reseal My Shower Tile?